Home / AMU News / AMU extends date of continuation. official notice by AMU controller. Recently , a decision was taken by the authority to levy charges on those student's who do not submit their fees and provide continuation in time as , at the last moment it creates a problem and hurdle in the way of offices and the controller respectively . The charges which where levied on student's recently was removed because of the resisitance from student's and senior's who later took the matter in their own hand's and were successfull in demanding an extension and exception from the charges. will however be the last date to submit without the late fee charge , notice will be put by tom in the majority of departments . 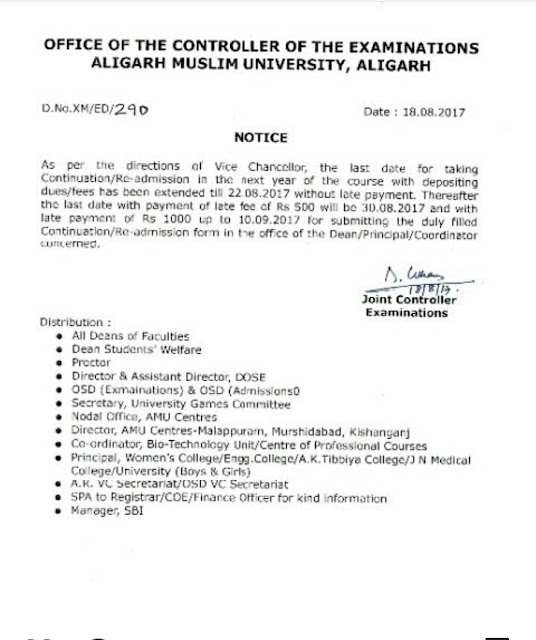 All student's are requested to pay at the earliest as there will no more extension provided . Student's who have already paid can demand a refund if possible by contacting the controller office .